Allows for quickly filling 55 gallon drums with 2” plug. 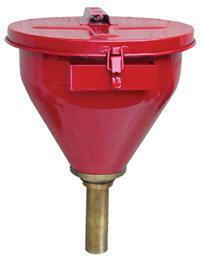 Includes 8-3/4” long brass flame arrestor safety. Hinged lid with fusible link automatically closes at 160°. Lid latch may be locked for security (lock not included). Fits 2” NPS threaded drum bung. Gasket included for tight seal. Steel construction with painted finish.